C-KOE products are of the highest quality, purity and standards. 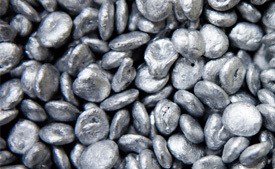 C-KOE Metals uses primary aluminum from select sources around the world. Their products range from 99.7% to 99.996% pure aluminum. C-KOE produces primary Aluminium shot, 5-pound notch bar, and other shapes and sizes. Most products are custom-made to customer specifications. C-KOE’s Aluminum has been used in the production of diverse products such as titanium alloy, water purification chemicals, catalysts, high quality paints, specialty alloys and other proprietary products and specialized chemicals.